A great exterior paint job starts with the proper preparation. 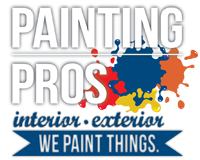 The professionals at Painting Pro’s will assess, clean, repair, and prep all exterior surfaces before the paint is ever applied, ensuring the best long-lasting finish for your home. We use tried and tested paint products for a quality covering you can trust to remain beautiful for years to come. Not sure what color to choose? The experts at Painting Pro’s can provide design knowledge and a critical eye to help you choose a color scheme you will love. With many color resources and years of experience, Painting Pro’s can help you find your vision and make it reality.